Seven Falls is one of the most popular hikes in Tucson. And it’s easy to see why. 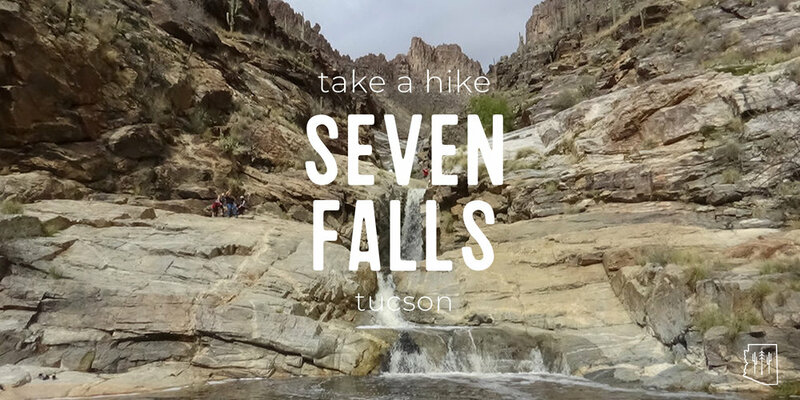 Besides being the #1 rated trail in Tucson by All Trails, it boasts seven waterfalls, incredible views, and a moderately easy hike. 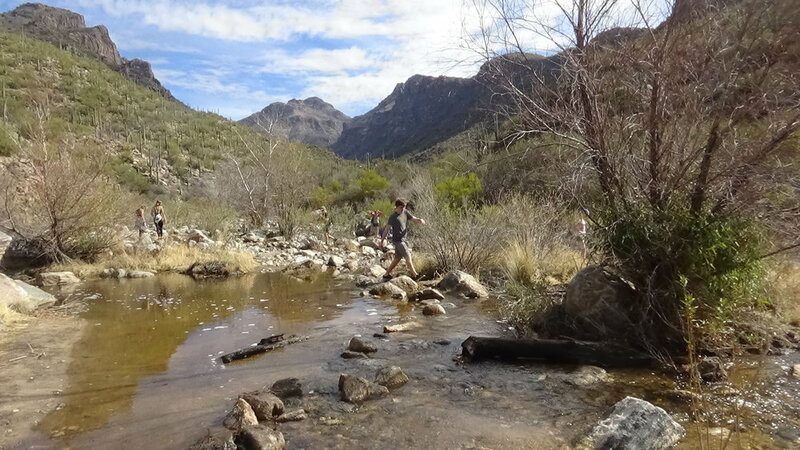 You can find the trail to Seven Falls (Bear Canyon Trail) in Sabino Canyon Recreation Center. 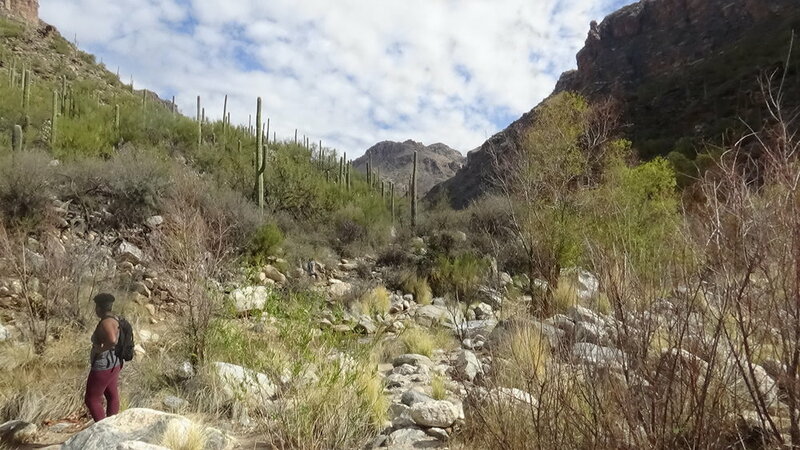 Sabino Canyon is one of my absolute favorite places to hike in Tucson. There are so many different trails to travel and all offer incredible and versatile experiences. When you reach the trailhead, you will see bathroom facilities (flush toilets, yay!) and a place to fill up your water bottles. Take advantage of this refill station! Although it’s not a particularly strenuous trail, it is long and most of the path is in direct sunlight so you will get thirsty. On the trail, you will find yourself immersed in Sonoran Desert beauty, surrounded by towering saguaros, many species of cholla, and ocotillos. You will notice a subtle incline as the you begin your journey across Sabino Creek. The first six water crossings are clustered together in a 0.6 mile stretch. I would highly recommend checking water levels before your adventure. During monsoon season, the trail can be inaccessible and flash floods are a real thing in the desert. So just double check. Last time I hiked this trail, it had rained in Tucson for two straight days. The falls were roaring (DOPE) but I definitely would have appreciated water shoes or sandals. Unless you’re an expert rockhopper (hit me up, I’d love to learn your ways), shoes that you don’t mind getting wet are the way to go. The seventh (and final) crossing is the least obvious and where most hikers end up missing the right place to cross. After the crossing, the trail begins to switchback and climb on the right side of Bear Creek. Eventually, the trail flattens and you’ll reach a trail fork shortly after the seventh crossing. To find the falls, go left. If you venture right, you’re in for a much longer hike along Bear Canyon. Because the falls are in the canyon, you won’t necessarily see them until you're minutes away. Once you hike down, you will find many people enjoying the falls. People like to cliff jump, swim, sunbathe, picnic, and simply reconnect with nature. Best time to hike? Late winter or early spring when the falls are fed by snowmelt or heavy rains. Something You Should Know: You can either walk or take a tram to the trailhead (does not take you all the way to the falls). If you take the tram, bring cash! There is an ATM inside the gift shop (with ATM fees). The tram only costs $4 to ride up to the trailhead. I really love that they have this option. Taking the tram basically cuts the hike in half, making it only 4.6 miles roundtrip. This is super convenient if you’re in a time crunch or not wanting to commit yourself to an 8-mile hike. If you do ride the tram, make sure you know when the last one returns to the visitor center. Otherwise, you’re hiking back! Want to walk? Expect a paved road. 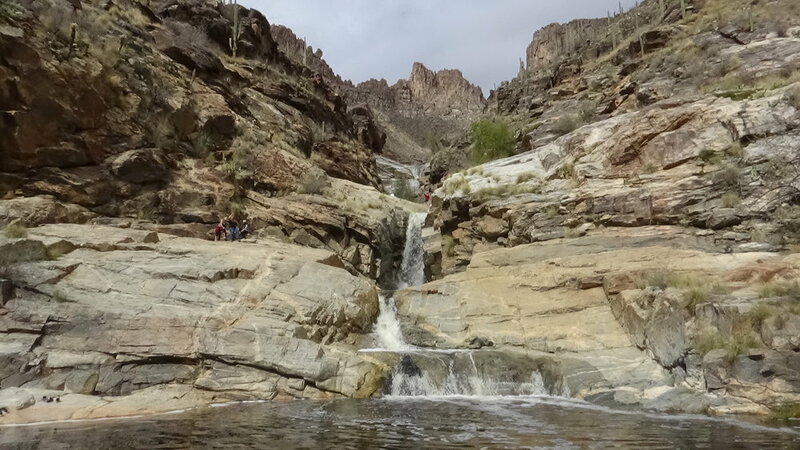 Seven Falls Trail is 15 miles northwest of downtown Tucson in Sabino Canyon Recreation Center. Park in the main parking lot and head towards the visitor center. This blog was thoughtfully written by Kat Rumbley. You can find her on Instagram at @thecuriouskattt.